Home / cooking workshop / pizza / pizza making / quezon avenue / shakey's / shakey's family pizza / shakey's junir pizza masters / summer activity / Get Ready for the Shakey's Junior Pizza Masters! 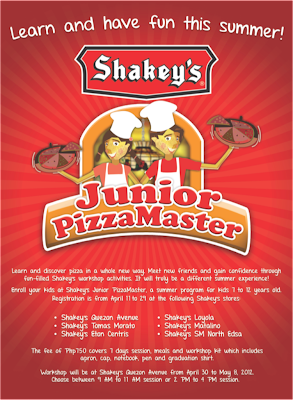 Get Ready for the Shakey's Junior Pizza Masters! More than the white-sand beaches and wonderful summer activities under the sun, Shakey's Family Pizza bring in one ground-breaking and ultra-fun summer activity that your kids could enjoy. Get ready because here comes the Shakey's Junior Pizza Masters! This summer, Shakey's challenges kids aged 7 to 12 years old to become Shakey's Junior Pizza Masters. A first of its kind in the country, this summer program will immerse your kids in the world-renowned tag of fun, family, pizza. Shakey's Junior Pizza Masters will train your kids to Basic Pie Making, Pizza Construction and Dough Tossing as well as they will also undergo hands on in-store exposure like Order-Taking, Hands on in-store experience, Basic Sanitation and Utensils Familiarization. And by the end of this summer course, the new Shakey's Junior Pizza Masters will be guaranteed experts in making the Shakey's world famous brick oven baked pizza. Registration is currently ongoing at Shakey's Eton, Shakey's Loyola, Shakey's Matalino, Shakey's North Edsa, Shakey's Tomas Morato and Shakey's Quezon Avenue until April 29, 2012. The training fee of P750 is inclusive of notebook and pen, apron, meal stubs for 7 days and a graduation shirt. There will only be 100 slots available, with a morning or afternoon session of your choice, so hurry now! The graduation, which will take place on May 8, will be made more exciting as the first-ever batch of Shakey's Junior Pizza Masters will perform a Dough-Tossing Demo along with fun games and prizes! So, what are you waiting for? Let your kids have a more meaningful and delicious summer activity! 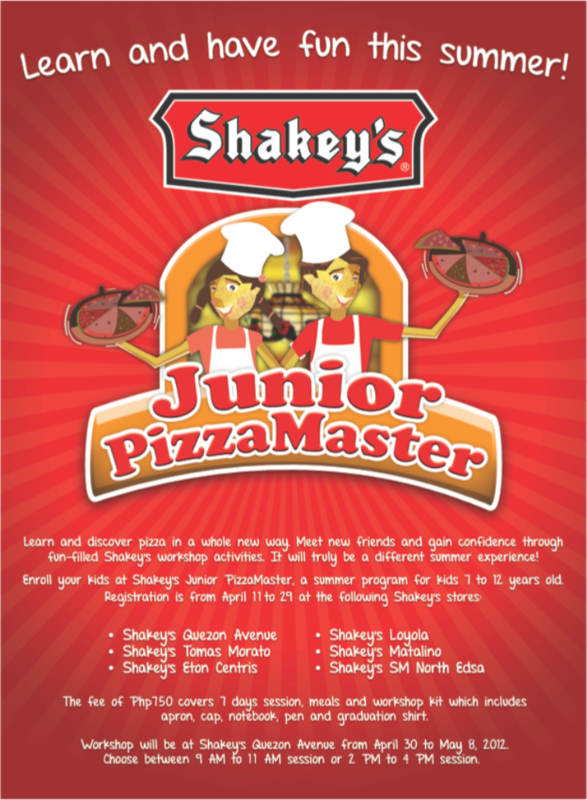 Enroll them now at Shakey's Junior Pizza Masters workshop! For inquiries, log on to www.shakeyspizza.ph or you may follow Shakey's on Facebook at www.facebook.com/ShakeysPH. You may also call 839-01-51/09175985759 and look for Ms.Debi Labarda or Ms. Eymare Bacasmas for more details.